Bank Negara Malaysia published three documents on stress testing to reinforce the importance of stress testing. However, it is the sole responsibility of financial institutions to determine their own strategies, to design and develop stress testing methods that fit their business environment and profile. The challenge in stress testing is that in needs deep knowledge in quantitative analysis, risk modelling and also technical acumen on statistical packages. 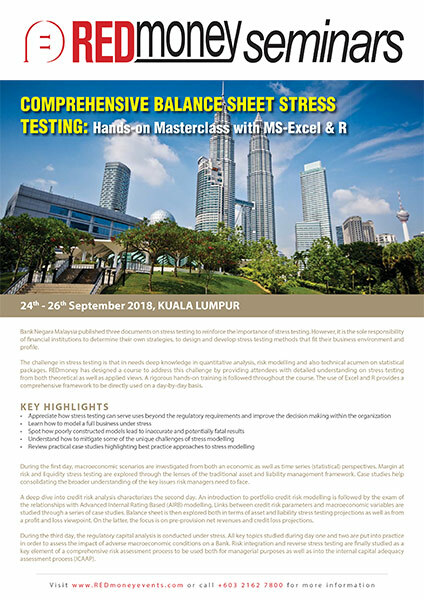 REDmoney has designed a course to address this challenge by providing attendees with detailed understanding on stress testing from both theoretical as well as applied views. A rigorous hands-on training is followed throughout the course. The use of Excel and R provides a comprehensive framework to be directly used on a day-by-day basis. During the first day, macroeconomic scenarios are investigated from both an economic as well as time series (statistical) perspectives. Margin at risk and liquidity stress testing are explored through the lenses of the traditional asset and liability management framework. Case studies help consolidating the broader understanding of the key issues risk managers need to face. A deep dive into credit risk analysis characterizes the second day. An introduction to portfolio credit risk modelling is followed by the exam of the relationships with Advanced Internal Rating Based (AIRB) modelling. Links between credit risk parameters and macroeconomic variables are studied through a series of case studies. Balance sheet is then explored both in terms of asset and liability stress testing projections as well as from a profit and loss viewpoint. On the latter, the focus is on pre-provision net revenues and credit loss projections. During the third day, the regulatory capital analysis is conducted under stress. All key topics studied during day one and two are put into practice in order to assess the impact of adverse macroeconomic conditions on a Bank. Risk integration and reverse stress testing are finally studied as a key element of a comprehensive risk assessment process to be used both for managerial purposes as well as into the internal capital adequacy assessment process (ICAAP). Worked in risk management and finance across Europe, London and New York for the past 20 years. Experience include EY Financial Advisory Services in London, HSBC headquarter, Prometeia and other global leading companies. Guest lecturer at the London School of Economics, Imperial College of London, University of Passau in Germany. Doctorate in statistics from University of Milan and London School of Economics. Authored papers published in European Journal of Operational Research (EJOR), Computational Statistics and Data Analysis (CSDA) and other top reviewed Journals. Referees of Journal of Banking and Finance (Elsevier) and Journal of Applied Statistics (Taylor &Francis) and other top Journals. Trainer in risk management and statistics, he is also a Chartered Public accountant and Tax Expert.